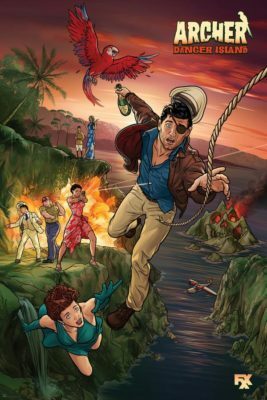 Last week’s episode of ARCHER: DANGER ISLAND offered up a nice change in pace over the last few episodes of the season by really ramping up the action elements of the show, while also reuniting the three groups of characters into one narrative arch. While it wasn’t as comedically pleasing as episodes from recent weeks, it was still a satisfying battle-heavy episode with a few good laughs along the way. 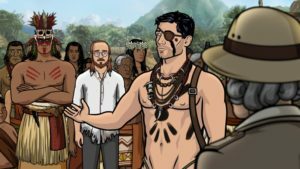 The start of the episode features Archer (H. Jon Benjamin) and Pam (Amber Nash) enjoying their newfound alliance with the local cannibals. With Fuchs (Chris Parnell) and his Nazi goons fast approaching to attack their village, Archer is tasked with training the cannibals to ward off the incoming attack. There’s a fun bit of banter between Archer and Noah (David Cross) who still struggles to translate Archer’s idioms into the native tongue, particularly when Archer suggests that the only way they would be ready in time is if they had a training montage. The episode does a fine job in establishing the traps Archer has devised before the attack, each manned by a unique group of cannibals such as the old men hiding in pits, a giant spiked swinging log called “The Widowmaker,” and my personal favorite “The Chub Club” – a group of obese kids with blow darts. But just as the battle plans are set, none other than Malory (Jessica Walter), Ray (Adam Reed), Lana (Aisha Tyler), Charlotte (Judy Greer) and Crackers (Lucky Yates) arrive at the camp. Easily the best part of this interaction is how the cannibals declare Charlotte a goddess who obviously accepts her newfound deity with insane levels of enthusiasm. This unfortunately sets up the B-plot of the episode that doesn’t really go anywhere as Charlotte and Lana essentially stay in a hut and bicker while the the battle rages on outside. As for the battle, this is probably the most gruesome action sequence the show has ever produced. Both cannibal and Nazi soldiers are horribly mangled with mortar rounds, guns, arrows, and spikes with blood and gore aplenty. Of course featuring graphic violence is in no way something new for the series, but with nearly half of the episode dedicating its time to such a bloodbath it does feel a little more like padding for a pretty thin episode. Fuchs essentially spends the whole episode high on cocaine and shouting orders at his Nazi soldiers. Parnell’s German accent still isn’t my favorite, but the fact that spends the majority of his screen time with a “Hitler Mustache” made out of cocaine was admittedly a clever sight gag. However, his final stand with the ALIENS-inspired mech suit was definitely a fun callback to the Season 3 Space Pirate episodes and hearing his coke-fueled maniacal laugh after losing an eye in the fight felt like the first time Fuchs feels like a formidable villain for the season. Overall, COMPARATIVE WICKEDNESS OF CIVILIZED AND UNENLIGHTENED PEOPLES felt just as padded as its title suggests. It wasn’t necessarily an unenjoyable episode, but I’m definitely hoping that the remaining three carry a little more narrative weight as they bring DANGER ISLAND to a close.